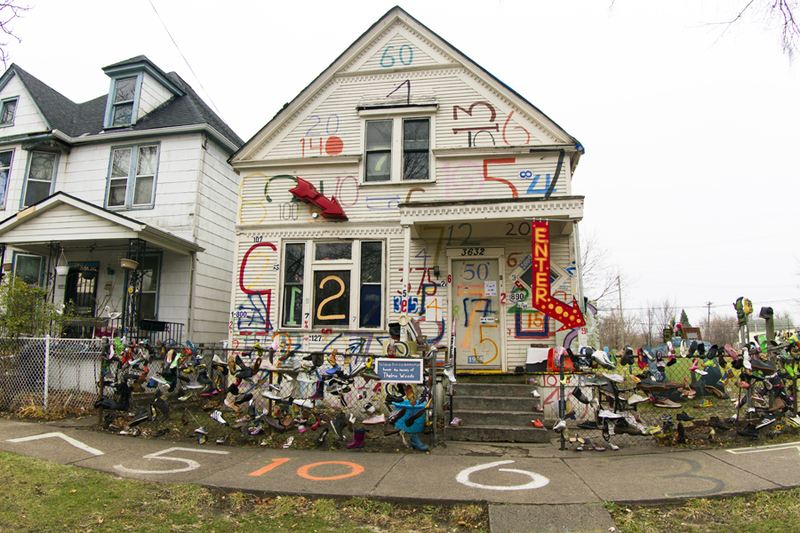 The Number House, which is used by the Heidelberg Project, is up for auction. All photos by Steve Neavling. 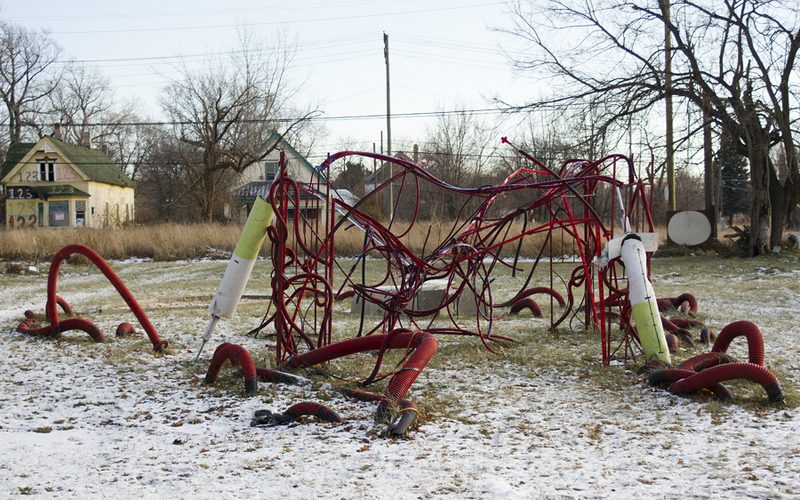 Three popular properties at the world-famous Heidelberg Project on Detroit’s east side are up for auction because of delinquent taxes. The minimum bid is $7,400 to cover the costs of delinquent taxes. If the house doesn’t fetch a bid by Sept. 17, it will be auctioned again, starting at just $500, like the other two properties. This house, which is adorned with paintings of birthday cakes, is up for auction. The project’s artist, Tyree Guyton, painted numbers on the house and sidewalk to honor the homeowner. A vacant lot also is up for auction. Well they certainly haven’t increased spending (outside of their budget, remember all the whining for additional donations) on security, paying property taxes on the parcels they own, acquiring other properties so “integral” to the project. And they sure don’t spend much on maintaining what they have. So where does their money end up going? Guyton is nuts. 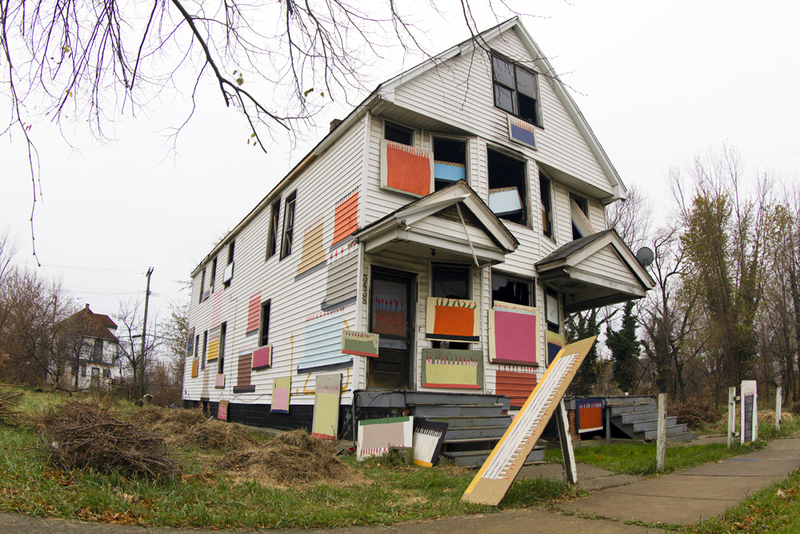 Only in barbarized Detroit could this rubbish be seen as art. Tear it down. Is this part of the art? I just don’t get it. Is Heidelberg meant to be a transient experiment or permanent installation; a commentary on abandonment and re-thinking of an urban neighborhood? It doesn’t seem like a difficult proposition to purchase the properties, particularly considering all the money they raise, to solidify the mission of the nonprofit. Disgraceful. You really think they spend their free time pondering sociological affects and turn them into art on such a philosophical level? What they have exhibited is a high budget for delinquency, and profits that go nowhere but in their pockets. Oh, they also practice the art form of not communicating with ANYONE. Please sell the property and bulldoze down what ever structures are left. That is not art; I don’t care what anybody says. It’s a stinking eyesore and if I lived anywhere near it I would be celebrating with each new fire. Nobody with an ounce of sense would want to live by that ugly mess. Another suburban art critic makes their voice heard. Thanks for playing.